Have you ever pictured what a perfect something would be for you, and then you found that perfect something and it wasn’t what you’d originally imagined? It could be anything – your perfect lover, house, city, shoes, dog, bra, retirement plan, or universal remote control. Maybe you thought your ideal boyfriend needed to have exactly your taste in music, lots of money, and look like Robert Downey Jr. Then you fell in love, and you learned that all you really needed was someone who’s great in bed, laughs at your jokes, and can’t wait to rewatch all 7 seasons of Buffy the Vampire Slayer with you on a yearly basis. That kind of just happened to me, but with sunscreen – Hada-Labo UV Creamy Gel SPF 50/PA ++++, to be specific. I’ve spent a long time looking for my perfect sunscreen, and I felt really sure it was going to have to be alcohol-free and contain a considerable amount of mineral-type protection. I tried a lot of sunscreens over the past year – chemical ones, mineral ones, sunscreens from Japan, Korea, Europe, and the US, sunscreens with and without alcohol – you get the idea. I found some pretty good ones along the way (I’ll be reviewing many of them in the coming weeks), but only Hada-Labo UV Creamy Gel became my all-time favorite despite the fact that it isn’t alcohol-free, nor does it contain a lot of mineral ingredients. I’ll talk about what makes it so special in just a minute, but first, let’s talk about what it is. Hada-Labo UV Creamy Gel SPF 50/PA ++++ is a Japanese, gel-textured sunscreen that promises to effectively protect skin from UVA and UVB rays, as well as moisturize skin without causing irritation. It is hypoallergenic, fragrance-free, and contains no colorants. PA ++++ is currently the highest classification of UVA protection available. If you need more information about the PA rating system, I break it all down in my recent review for Kanebo ALLIE EX UV Protector Gel (Mineral Moist) N SPF50/PA++++. The first thing that stood out to me about this formula was how low on the list Titanium Dioxide appeared. I must admit, I was a little disappointed – when I bought this sunscreen, I was shooting for a solid combination of chemical/physical protection – chemical for its high efficacy, and physical for its longevity. The low titanium dioxide content meant that I was primarily getting chemical UV protection with this sunscreen. However, I was happy to see the absence of fatty alcohols such as Cetyl, Stearyl, or Cetearyl Alcohol – sometimes those can trigger breakouts for me, especially when using the amount of product needed for effective sun protection. I was also very excited to see so many moisturizing ingredients in the formula, including three different forms of hyaluronic acid (Sodium Acetate Hyaluronate, Sodium Hyaluronate, Hydrolized Hyaluronic Acid). This is a chemical UV protector that is often listed in products as Octinoxate. In addition to protecting against UV rays, it also helps stabilize light sensitive product formulations, so it’s sometimes seen in non-sunscreen skincare products. Of the chemical sunscreen agents, this is one of the gentlest, but like many chemical sunscreen ingredients, it can still cause a photoallergic effects or photosensitization in some people. This is a silicone-based UVB filter that often goes by the trade name, Parsol SLX. It’s highly effective, very safe, and approved for use in Japan, Southeast Asia, China, Australia, and all of Europe. A study published in 2010 by the Scientific Committee on Consumer Products (a scientific European Committee that reviews cosmetic safety) showed this ingredient does not pose any phototoxicity, photoallergenic, photomutagenicity, or photoclastogenicity risks. Better known by its trade name, Tinosorb S, Bis-ethylhexyloxyphenol Methoxyphenyl Triazine is a highly effective UVA and UVB filter. It’s extremely photo-stable, and works spectacularly with other UV filters, both organic and inorganic. It carries a much lower risk for skin irritation or allergic reactions than other chemical UV filters. It’s approved for use in Asia, Europe, and Australia. This is a chemical sunscreen agent that effectively absorbs and breaks down UVA. It’s often referred to by its trade name, Uvinul A Plus, and is one of the safest chemical sunscreen agents available – a study published in 2008 by the Scientific Committee on Consumer Products showed this ingredient not to pose any phototoxicity, photoallergenic, photomutagenicity, or photoclastogenicity risks. It’s a very effective UVA absorber, and works well with other sunscreen agents. It does not protect against UVB, but pairs well with those that do. It’s approved for use in sunscreens in all of Europe, as well as Japan, Taiwan, Mexico, and South America. This is physical UV blocker with a high refractive index, and is capable of protecting against both UVA and UVB rays. It’s considered to be very safe, and is often used in sunscreen formulations made for babies or people with sensitive skin. According to CosDNA, alcohol scores a 3 out of 5 as a potential irritant. Triethanol amine scores a 3 out of 5 as a potential irritant, and 2 out of 5 as a potential acne trigger. 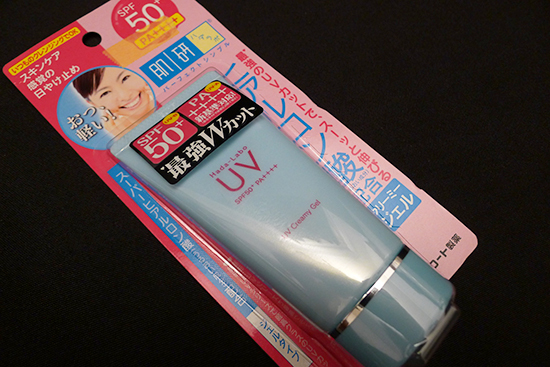 Hada-Labo UV Creamy Gel SPF 50/PA ++++ comes packaged in blue, plastic, 50g tube. It’s fairly minimalist as far as cosmetics packaging goes, but it does the job. The dispenser is a typical tube opening. The product itself is a creamy gel that is a nearly opaque white..
Hada-Labo UV Creamy Gel SPF 50/PA ++++ smells faintly of silicone. The smell is undetectable once applied. I normally advocate applying chemical sunscreen first, before applying any other skincare products. There is some evidence that chemical sunscreens perform better when applied directly to the skin, as explained in this article by Dr. Neal Schultz, M.D., a dermatologist who feels passionately about the theory. However, I prefer to apply Hada-Labo UV Creamy Gel after all of my skincare products, and the reason is that Hada-Labo UV Creamy Gel has the unexpected benefit of making an absolutely amazing makeup primer. More on that in a minute. As with all sunscreens, you need about a ¼ teaspoon to get the full SPF protection listed on the front of the bottle. To make this process easier, I’ve been doing a double 1/8 teaspoon application instead of attempting the whole ¼ teaspoon at once. Once applied, I let it absorb for about 5-10 minutes. It has no white cast, and it absorbs much more quickly and easily than the Kanebo ALLIE EX Protector Gel and most of the alcohol-free and cream-based sunscreen formulas I tried. It does not absorb as quickly as Biore UV Aqua Rich Watery Essence, which I think might actually be the fastest absorbing sunscreen ever made by humans. Once dry, Hada-Labo UV Creamy Gel has a really interesting finish – it’s not heavy or greasy at all, but it is somewhat shiny. It leaves the skin feeling slightly moist. Not in a gross, sticky way though – it just feels like my skin is really well hydrated. I’ve tried other sunscreens that never completely dried, and they always felt greasy. 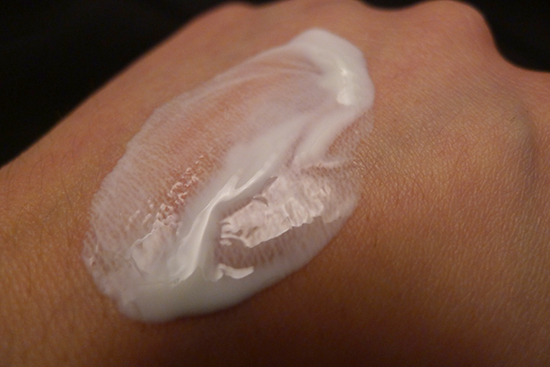 I suppose some would call that feeling “moist,” but the finish of the Hada-Labo UV Creamy Gel isn’t like that at all. It’s far more pleasant. It’s not tacky, suffocating, or dirty feeling. It’s not unlike the feeling my skin has after applying a hyaluronic acid cream (I find hyaluronic acid serums to be more sticky than creams). For someone with dry skin, this is a dream come true. In the past, I’ve often reached for Biore UV Aqua Rich Watery Essence because it feels light, and absorbs incredibly quickly. The drawback is that for someone with dry skin like mine, the Watery Essence is usually drying, and frequently causes my makeup to flake within an hour of application. The Hada-Labo UV Creamy Gel is the best of both worlds – it absorbs very quickly and is easy to apply, but it doesn’t dry my skin out at all. 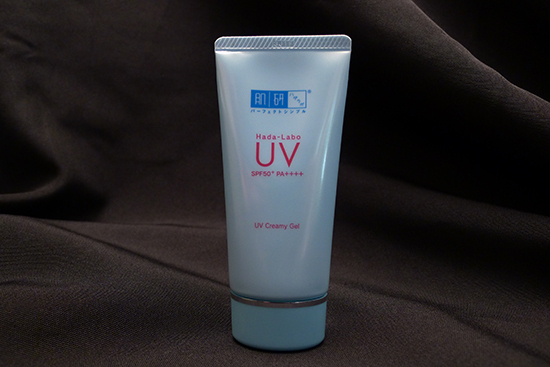 Additionally, Hada-Labo UV Creamy Gel does not feel greasy or heavy. I think someone with normal skin could probably skip moisturizer altogether when using this sunscreen. I’ve used Hada-Labo UV Creamy Gel for a total of around 8 weeks, in 4 weeks spurts over the past few months. I have never experienced any irritation or acne as a result of using this sunscreen. I’ve also never experienced any flaking, dryness, greasiness, or interference with my makeup. In fact, Hada-Labo UV Creamy Gel actually extends the wear of my makeup by a few hours when I use it, giving it the unadvertised benefit of acting as a makeup primer. Also like a makeup primer, it seems to smooth over any small imperfections in skin texture or pore size, so the finish of my makeup when I use this sunscreen appears flawless. There was a time when I was sure my perfect sunscreen had to be an alcohol-free, combination chemical/physical formula. I was wrong. What I really needed was a sunscreen that didn’t feel gross, didn’t dry me out, effectively protected me from UVA and UVB rays, and made my makeup look amazing. 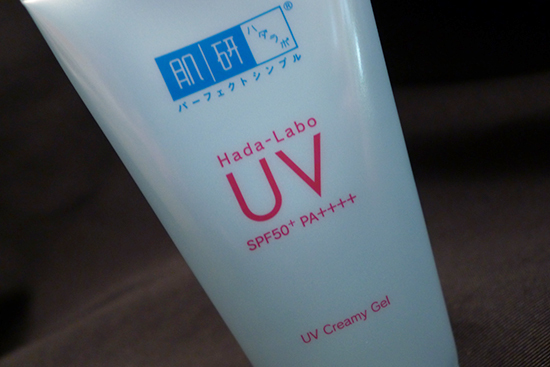 Hada-Labo UV Creamy Gel SPF 50/PA ++++ does all of that, and that’s what makes it my Holy Grail sunscreen. I found it fun how you introduced this product. I definitely appreciate your way with words. And I’m happy to hear you found your holy grail sunscreen! This is very likely the quickest purchase I’ve ever made following reading one of your reviews. I’m looking forward to trying it myself! I just ordered from Japan Stream via Amazon. Thanks, Cynthia! 🙂 You’ll have to let me know what you think of it once you’ve tried it! Here’s another sunscreen (by CeraVe, SPF 30) I’m potentially interested in trying (I think it’s new). Have you tried this one? I think it’s worth checking out the reviews in this link. Apparently, it may not rub in well or be appropriate for more oily skin types. I’m still curious I have to admit, but it may not be quite as awesome as I thought it might be initially. I do like the CeraVe Foaming Facial Cleanser you recommended though (it feels lightly/gently hydrating/soothing and was my first real introduction to the CeraVe skincare line). Currently, my favorite sunscreen is Clinique City Block Sheer – Broad Spectrum SPF 25 (mineral with slight tint). My somewhat very sensitive skin likes it 🙂 Plus the tint is nice; even if it only helps a little, sometimes it motivates me to use sunscreen because it also tones down light redness a bit (heavier redness requires much more coverage, but this step is still nice, almost like a lightly tinted primer, before using higher coverage makeup). Beautypedia says this can be used as a moisturizer as well based on the ingredients (the one you reviewed here sounds similar in that regard, so I’m excited to try it and possibly save a step when I have less time, but need sunscreen and some hydration too, which is like all the time 😉 ). I also have an elta MD UV Clear SPF 46. I’m unsure if I’ll ever repurchase this one, but I definitely don’t dislike it! It seems like a gentle formula. Oh, and I knew I got a Korean sunscreen in the first Memebox for men box (I’d heard in a review that the products were appropriate for women too and it did not disappoint), but I was unsure of the stats. So I just checked it out. At first I thought I couldn’t find the SPF rating and details, but I did… it’s SPF 50+/PA+++! 🙂 I haven’t tried it out yet, but when I do, I’ll let you know how it is. I’m happy it’s rated similar to the Korean sunscreens you’ve been trying out. This one is DTRT brand; I’m unsure where it can be purchased, but I thought you might find it interesting to be aware of. I really don’t care if face products are geared toward men or not if I like the formula and ingredients. It has Ethylhexyl Methoxycinnamate as the third ingredient (instead of as the 2nd ingredient like the product you review here). The 2nd ingredient is Cyclopentasiloxane, which apparently is a Silicone. I think I’ll like the one you reviewed better than this one since I love anything with Hyaluronic Acid in it (as long as there is no fragrance or irritants in combo with the formula) and currently nothing I’m using regularly has this beloved ingredient in it. I have the bb cream from this line (hada labo bb moist cream) and I’ve been thinking about getting this sunscreen for awhile. I’m definitely going to get this now! Hi Grace! Tell me more about the BB cream! What do you think of it? I’d be interested to know what the coverage is like! Does it have any UV protection? I have the oiliest skin ever. I basically only cleanse and apply the Benton toner in the morning. No moisturizer and my skin still manages to oil up during the afternoon. I’m pretty sure this sunscreen would be too moisturizing.. The Biore one sounds interesting, but with so much alcohol I don’t know if it could trigger a reaction from my sensitive skin. Is there any other sunscreen you could recommend for an oily skin ? Let me think about that one a bit, Yaunting. Most of the sunscreens I know would be good for oily skin in have alcohol in them, but I’ll rack my brain for one that doesn’t. My skin is more combination possibly leaning oily in the summer. And this is one Kerry mentioned on her skin routine page. Apparently, it can be purchased on Amazon with free shipping as well. It got over 4 stars (out of 5) average rating by over 600 reviewers I just noticed!! Anyway, I stumbled on the fact that this might be a cool, appropriate recommendation. Plus, you have so many sunscreens you are testing out lately I wondered if you forgot about this one, didn’t realize was alcohol-free off the top of your head (like I didn’t) or was unsure of the formula for oily skin. Hope this info helps! I’m glad I tried it/used it today and thought of that! 🙂 So in conclusion, I definitely don’t think it’s overly moisturizing for oily skin from my experience today. Sometimes, I can get overly heavily handed with certain skincare products, which can get me into trouble, but today I felt the like the perfect amount comfort-wise got on my face… not too much, not too little, and well covered. I don’t yet use a measuring spoon to apply sunscreen; just being more diligent about applying sunscreen as I’ve been outdoors more or been indoors near more sunlight/with window blinds up has felt like an accomplishment. I actually just tried this sunscreen. People with sensitive skin should note that there is niacinamide in this sunscreen. I failed to patch test this first, and now I have a sweet rash on my neck. Just an fyi. Oh no, that sounds miserable! 🙁 How did you find out there’s niacinamide in it? I’ve looked through several ingredient translations, and none of the lists I’ve seen for this sunscreen has niacinamide listed as an ingredient. Is it possible a different ingredient caused the reaction? Purified Water, Cyclopentasiloxane, Niacinamide, Octyldodecyl Neopentanoate, Hydroxyethyl Acrylate/Sodium Acryloyldimethyl Taurate Copolymer, Polyisobutene, PEG-7 Trimethylolpropane Coconut Ether, Sodium Hyaluronate, Tocopheryl Acetate, Lactic Acid, Oleth-3 Phosphate, Phenoxyethanol, Butylene Glycol, Iodopropynyl Butylcarbamate, Triethoxycaprylylsilane. Ah yes! That makes total sense. The Elta MD Clear definitely contains niacinamide. I love niacinamide so it’s a selling point for me, but I can see how that sunscreen would be a nightmare for someone with a sensitivity to it. That’s good to mention about the niacinamide. It sounds like you had a really unpleasant experience. I do recall another person that was sensitive to niacinamide on another blog and they couldn’t use olay regenerist products. Have you ever tried the Clinique City Block Sheer SPF 25? There is no niacinamide in it. Do you have another favorite sunscreen? Yaunting, I think MsFireGlow’s suggestion for Elta MD Clear SPF 46 is a good one to start with! It is an alcohol-free, all mineral sunscreen. It’s actually the best all mineral sunscreen I’ve tried so far. It’s only weakness for me is that the UVA protection it offers isn’t as strong as some of the chemical UVA filters available in Asian and European sunscreens, including this Hada-Labo UV Creamy Gel. nice to discover a newbrand and product via your post! Since you’re on the search, have you tried the Kiss My Face SPF products? I am trying to go as chemical free as possible and I’m very happy with their line. Hi Arielle! I’ve only tried the Kiss my Face spray SPF, which I liked okay for my body but not my face. I haven’t tried any of the cream/lotion style a Kiss my Face sunscreens. Do you have one you’d recommend in particular? Hi Kerry, finally :-). Hmmm…this sunscreen has paraben in it. Have you tried Biore UV, SPF 50+, PA++++, Perfect Face Milk? I got it after your other Biore sunscreen review. Ethylhexyl Methoxycinnamate 5.0%, Cyclopentasiloxane 25.7%, Zinc Oxide 12.0%, Lauryl Methacrylate/Sodium Methacrylate Crosspolymer 6.0%, Titanium Dioxide 0.47% Cyclomethicone, Dimethicone, Alcohol, Water, Lauryl Methacrylate/Sodium Methaxcrylate Crosspolymer, Talc, Glycerin, Titanium Dioxide, Methicone, Mica, Polysilicone-9, Peg-12 Dimethicone, Peg-3 Dimethicone, Cetyl-Pg Hydroxyethyl Palmitamide, Aluminum Hydroxide, Silica, Iron Oxides (Ci 73360), Bht, Barium Sulfate, Aluminum Dimyristate. I haven’t tried the Biore Perfect Face Milk, but it’s on my list. I’ve heard it’s drying on dry skin, but I haven’t tried it myself yet! Hi Kerry, no I am not sensitive to parabens but took it out of my skincare routine because it was banned in europe and read documents against it and parabens were found in cancer biospics. Hey Charlotte! You’re right – Europe may be banning a few really specific parabens, which are not commonly used anyway (and don’t include the ones in this sunscreen). However, the European Union Scientific Committee on Consumer Safety conducted a fairly extensive examination of more commonly used parabens in 2013, and deemed them not to be a health risk. This is the EU Scientific Committee study: http://ec.europa.eu/health/scientific_committees/consumer_safety/docs/sccs_o_132.pdf. The concern about parabens and cancer came up because of a study conducted in the late 90s that found paraben traces in breast cancer tissue. 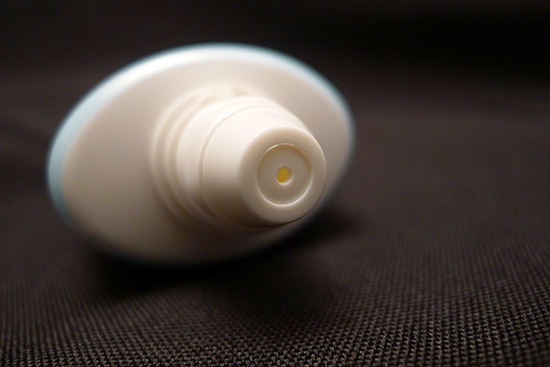 The reason the study was flawed was that no research looked for parabens in healthy tissue. So far, no one has been able to establish that there are more parabens in breast cancer tissue than normal, healthy tissue. The biggest paraben risk for common ones is a possibility of increased UVB damage with the use of methylparaben, which this formula does contain. However, since it is a sunscreen product, that particular risk isn’t applicable in this product. HI Kerry, I really appreciation all the information, will definitely read it. I never though you were trying to strong-arm me at any point. I have been using the biore perfect face milk it is drying, I think it’s why my skin has gone from oily to dry type lol. I am just loving it, because now all I have to do is add a moisturizing step and bam, no more fighting oil. Not suitable for dry skin, imho. Good to know! I had my suspicions, but you’ve confirmed that the Biore Face Milk wouldn’t agree with my skin type. Kind of a bummer, but maybe good news for folks with oily skin. I’m going to test that Buffy thing with this sunscreen soon, Rebecca. Also, I can’t believe you haven’t watched it! I personally have a hard time with season 1, which has a monster-of-the-week format that gets stale a little quickly for me (but absolutely necessary viewing for a first time watcher). From season 2 on, it’s rock solid storytelling through and through. Aaaaaaaaahhhhhhh!!!!!!!!!! Shriek of joy!!!!!! I have been on the same sunscreen hunt my entire life!!!!! I must have tried every brand in the west and starting my foray into asian sunscreens. But since your review it looks like I can stop looking. Thank god, there is literally nothing more that I would love to end than my search for a sunscreen with the qualities you have described. I’ll look for the Heliocare XL Gel! Do you know of any places that sell it online? qua. Ethylhexyl methoxycinnamate. Styrene/Acrylates copolymer. Octocrylene. Diethylamino hydroxybenzoyl. Hexyl benzoate. C12-15 alkyl benzoate. Cyclopentasiloxane. Glycerin. Ethylhexyl triazone. C14-22 alcohols. C12-20 alkyl -glucoside. Bis-ethylhexyloxyphenol methoxyphenyl triaxine. Hexylene glycol. Zinc oxide. Polypodium leucotomos leaf protein/PVP crosspolymer. Titanium dioxide. Ethoxydiglycol. Phenoxyethanol. Xanthan gum. Tocopheryl acetate. Cetyl dimethicone. Camellia sinensis extract. Micrococcus lysate. Methylparaben. Propylparaben. Phytosphingosine HCl. Sodium carbomer. Parfum. Citric acid. Alumina. BHT. Disodium EDTA. Triethoxycaprylylsilane. Simethicone. Linalool. Limonene. Just ordered the sunscreen – looking forward to trying it! Between a tretinoin .025% regimen and wanting to halt any further sun damage (sunbathed a lot in my youth), I’ve become a total geek about sunscreen and have tried countless brands. The ones I keep repurchasing are Shiseido Ultimate Sun Protection (both cream and lotion formulas), EltaMD UV Clear spf46, CeraVe spf50 (the one msfireglow mentioned), and MD SolarSciences Mineral Cream spf 50 (my current fave for daily use). I like that last one because of its 17% zinc oxide and primer-like finish, and you can layer over moisturizer w/o that ‘heavy/cakey’ feeling. My sense is that Asian companies have a better selection of sunscreens, but if the percentage of sunscreen ingredient isn’t given, I likely won’t buy it. It’s also frustrating when the ingredients list isn’t in English, so I particularly appreciate that aspect of your reviews. I generally prefer a physical sunscreen over chemical, so I’m cautiously optimistic about Rohto Hada-Labo. Quick question: how much sun exposure did you get during your weeks of using this? It’s one thing to wear sunscreen to and from the office, but the real test is when you have to be outside for a few hours. My Korean skin tans very easily, even with spf 55/ PA+++, so I’m curious to hear your experience. Excellent question about the length sun exposure! That’s an important detail. I generally don’t spend a lot of time in the sun – all of my sunscreen trials are with standard exposure to and from the office, and to and from lunch. Occasionally, “to and from lunch” happens in the form of a 40 minute walk (20 minutes each way). I usually reapply sunscreen or top up with a high SPF BB cream before lunch. I try to remember to reapply before my drive home, but I forget a lot. When I’m going to be outside or in the car for a few hours, I wear a sun hat with UPF 50. I’m in love with the Biore sunscreen you reviewed but are there any spray/ aerosol type sunscreen you can recommend? If I’m going to be outside all day, I wouldn’t want to reapply my makeup or sunscreen which would disturb my makeup – a spray aerosol type sunscreen would be the perfect solution but all the ones I’ve tried leave such a “sunscreeny” shine. Oh, this sounds very interesting! Do you think this product is suitable for people with oily/combination skin? Or do you know how it performs in humid weather conditions? Hi Yuri! I think it’s possibly too much moisture for someone with oily skin, especially in humid weather. Humid weather doesn’t seem to be a problem with this sunscreen for dry skin, though. Hey not sure when I missed this but I like the new review system! This product looks pretty good, lately for some reason my skin has gone from oily to DRY (so weird no kidding) and I might need to change my regular sunscreen out for something like this. Thanks, Tiffany! 😀 So weird about the change in your skin type. Do you think it’s the Biore Face Milk, or something more than that? I think this review may have indirectly solved a mystery for me. Despite doing everything ‘right’ I kept getting flaky after applying bb or foundation over my sunblock, I think the sunblock might be too drying and the culprit! I already have a hadolabo haul on the way to me I might need to add this to the mix! That can definitely do it! Which sunscreen are you using these days? Is it the Biore Watery Essence? hi kerry i’ve used 2 sunscreens you reviewed, biore watery essence n kanebo allie. i’ve normal skin except very oily in nose. biore make my nose more oily than usual (because of the alcohol). kanebo is whitecast on me n make my entire face more oily (alcohol) and it’s greasy. after read your review i’m interested with this hada labo sunscreen. i like their skincare. I have oily acne prone skin. I might actually give this a try. The Japanese sunscreens I’ve tried before have all left me with dry flaky skin. Not fun. I just want something that will protect my skin without drying it. My go to sunscreen at the moment is the Replenix sheer physical sunscreen spray. But I feel I could use a bit more protection. I remember trying the Biore sunscreen and all that did was break me out, dry me out and it still didn’t keep me matte. It also had a slight white residue on my skin and it made my skin look dull. I just don’t think drying out our skin is better. Can cause more harm than good. I’ve been looking everywhere for a sunscreen that’s not too gross, does not leave white cast and doesn’t need a lot of time to dry. I really am happy you’re reviewing about sunscreens. Looking forward to buy this one. One thing I’ve started thinking a lot about lately is SPF for the skin around the eyes. 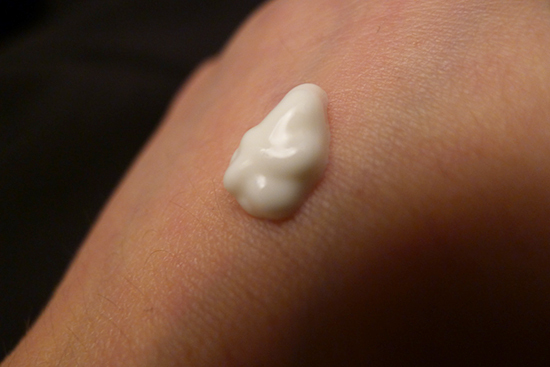 But there are surprisingly few eye creams with SPF (why is that?). I know that you don’t really need a different cream for the skin around the eyes, but I don’t feel confident enough to know if a cream is okay to use around the eyes or not. What about the Rohto Hada-Labo UV Creamy Gel? Do you think it’s safe to use on the skin around the eyes? I am absolutely in love with your blog. It’s extremely informative, delightfully organized, and easy to find what I’m looking for. It’s also clear you do your homework before your posts. 1/4 teaspoon is a lot, and the bottle isn’t very big. I go through a bottle every 3 weeks! Hi Kelly, I’ve been searching for a good sunscreen for a while now and this sounds intriguing. However being in my early twenties, and new to skincare the thought of using acids scares me. There’s just so much contradictory arguments on the topic. So I’ve no idea what to do, help! The best thing to do with acids is start out low and slow. The first step is to decide which acid you’d like to try first – BHA or AHA. BHA is better for acne, blackheads, and excess oil, whereas AHA is best for PIH, closed comedones, dryness, and uneven skin texture. Once you’ve chosen an acid, look for a product with either 1% BHA or 5% AHA. Paula’s Choice has some great options. I’d start there! I just got this sunscreen in the mail yesterday, and the packaging made me laugh–it looks like something you’d pick up at Daiso or some other similar dollar store. I did see your picture of the product, but I was unprepared for how it actually looks. I only mention this because it’s a sharp contrast to the nice packaging that Korean products have. Good thing that it’s the product itself that actually matters, eh? Can’t wait to try this! Hahahaha! I agree, Jule! The packaging totally looks like a prop for a PSA video about sunscreen. Another great review, my dear 😀 Loving the new rating system, as well! This sounds like the perfect sunscreen for me. I’m just about to finish my regular one (Scinic’s Enjoy Perfect Sunscreen SPF50 PA+++), and while I love it and have repurchased it multiple times, it just doesn’t wear well underneath my makeup. I have combination/dry skin, and it seems to make my T-zone uncharacteristically oily. I’m really keen to give this one a try, however I read on ratzillacosme.com that this cream wasn’t water/sebum/sweat-resistant. Can I ask for your thoughts on this? I’m not particularly fussed about water-resistance, because I’m looking for a daily sunscreen and I’m not really near water, but it not being sweat/sebum resistant worries me a little. Does this mean that when my skin starts to get a bit shiny, the protection of the sunscreen is compromised? Another great review 😀 This sounds like my perfect sunscreen. I’ve just about finished my current suncream (which I’ve already repurchased twice and is a very good product indeedy) but I’m looking to try an alternative, as I’m not a fan of how shiny it makes my T-Zone throughout the day and disrupts my makeup. My skin is normally combination/dry and so it’s agreeably hard to find a suncream that isn’t drying (looking at you, Bioré) but not overly moisturising. I definitely want something at least PA+++ and SPF50, so this is right up my alley. My concern is that according to ratzillacosme.com, this cream isn’t sweat/water/sebum-resistant. I’m not too fussed about it being water-resistant for everyday usage, but sweat/sebum worries me a little. Does this mean that if I get oil breakthrough during the day, the sun protection will be compromised? Okay, being me, I’d completely forgotten that I’d already commented with the exact same thing yesterday. Please excuse the double-up! And thanks for another enlightening review. I will definitely place an order for this sunscreen and can’t wait to try it. I was also wondering whether this would be a good option for teenage skin too and thought of asking about your opinion on this. My daughter is 14 and I was thinking that because of the gel-like texture this could be the right choice for her as I see her hesitating every time she sees a creamier texture. Not sure whether this suits every age ingredient-wise. Thank you so much for the quick response, Kerry!!! We’ll both try this then. A related question re: sunscreens and their reapplication during the day. I was looking for an answer to the necessity of reapplying sunscreen on a made-up face (it was during this search I came across your review). Now obviously Hada Labo’s sunscreen would be part of the pre-makeup steps but I found reccommendations about using mineral powders as a solution to this issue and, if I’m not mistaken, there was reference to actually resorting to cushion pacts with high SPF & P+++ as apparently they are easy to reapply without making a mess of one’s face. I’ve no experience with cushion pacts so would appreaciate your views if you have tried them. Just wanted to say that I bought this after reading your review, and I’ve been using it about a week and I seriously love it. I agree with everything you said. It’s amazing. It’s so good! I ran out and was caught without a backup bottle. I’m anxiously awaiting more to arrive! This sunscreen is amazing. So light and non-drying. Feels like you have no sunscreen on at all. I’m go to repurchase several tubes of this. It’s that good!!! Thank you for recommending it and it has become my HG sunscreen as well. Kerry, I’m looking for the expiration date on the tube. Could you tell me how to read it, if you know? I can’t decipher it myself. Thank you for sharing your knowledge on skincare. Have a nice day. Hi! I was wondering if you’ve tried the Hada Labo UV Whitening Emulsion SPF 50? It apparently doesn’t have any alcohol content and contains hyaluronic acid. Hi Caro! I have, and I plan to do a full review of it soon. Here’s a spoiler though: I like it a lot! “the fastest absorbing sunscreen ever made by humans” – love that! But I must respectfully disagree, because the fastest absorbing sunscreen ever made by humans is definitely Sofina Perfect UV White Protect. I do use HL UV Creamy Gel, but only on my body. I wouldn’t put it on my face. I’ve tried and it doesn’t agree with my very sensitive skin. Also, many Japanese women claim it makes them break out and that it’s not really suitable to be worn under makeup (I’m just going by what my co-workers are saying). Thank you again for another informative review! I’m very tempted to try this sunscreen out now after reading your post. I am also curious about your thoughts on Korean sunscreen since you mentioned at the beginning how you’ve tried some before. Have you heard or tried any of the sunscreen from the brand sum 37? I’ve read some of your previous posts on the brand and it seems they use beneficial ingredients in their skincare. Just want to know your thoughts in choosing between korean vs japanese sunscreen. Thank you! Hi Kerry, I have read somewhere that chemical sunscreen only works for a couple of hours and it is very hard to reapply over make up during the day. What is your solution to that problem? I have used clinique cityblock for many years and lately I have found the formulae not hydrating enough. Also the sunscreen seem to slide off my sweaty T zone. When I wear makeup, I still re-apply after 4 – 6 hours and it’s great! Really, this sunscreen is super easy going. Luv it! I was about to buy this sunscreen but unfortunately, Octinoxate has gotten me worried. Many articles that I have read consider it to be one of the worst ingredients that one can put on the body. Is there any base to it? Hey, Kerry – first of all, your blog has been such a help to me on my own skincare journey. Thank you so much for your super-informative, engaging posts. One question: How often do you reapply during the day, and does it interfere with your makeup? Like you, I’m more of an “indoor girl” but I always worry about adequate SPF coverage throughout the day. Me too, Sharon!Let me know how it works out! Thanks for your detailed review.it is very helpful and full of info. Hi, I’ve just recently discovered your lovely blog and really appreciate the time you take for these in-depth reviews! I have been on the hunt for a non-greasy sunscreen myself so I was hoping to try this one out (since I have normal to dry skin myself). However, I just have one question – do you know if this product has nanoparticles of Titanium dioxide? That’s one thing I am a bit wary about these days since the verdict is not very clear on whether that is safe for use, I’d just like to steer clear of it if i can. Thanks in advance! I came across your website from r/skincareaddiction on Reddit… And your website looks nice and all, and the article was very well-written, but what sold me was the kind of grading system you have at the end of it! The SKIN & TONICS RATING is awesome. Sort of like a tl;dr 🙂 It reminds me of the gaming reviews you see in magazines, and makes it easier to absorb a lot of info. I’m sure to be using your website more and more. I really want to try this, but it has Ethylhexyl Methoxycinnamate as the second ingredient (after water). This sunscreen ingredient is shown to have hormone-mimicking effects, and I have read its on the EU’s list over chemicals that must be studied closer because it may affect hormones. Any tips for a safer sunscreen?